Trust the process. Relax, really let that sink in. It's a process. You can feel it; it's formative, palpable, and within your grasp--and yet, it has no name, no label, no separative form of identification. It just is--a solid and indefinitely real form, and yet there's no restriction placed, no analysis or judgement. Hold it tightly, what does it feel like? Notice the texture, the temperature, the shape. How does it make you feel, how does it shift your vibration? Get into the resonance. If you listen carefully, there's a beat, there's a rhythm, and there's a pulse. It's beyond words, beyond concepts, and beyond time. You're tuning in now, you're allowing yourself to just have the experience. Just a true and authentic experience of being. Grounding, centering, and integrating--we enter a powerful force field with the approaching Annular Solar Eclipse in Taurus. The intensity of the previous Lunar Eclipse in Scorpio settles into a more stable and solid energetic configuration. There is a strong sense of arriving, of coming "back to earth". This Eclipse speaks to us deeply, it reaches into our very core and asks us to get real with what we truly want to bring forward, and to get active in the process of moving past immobility, stubbornness, and stagnation. But first, get solid in your foundation. That's really important. This is the second of three eclipses. This triple eclipse energy is a rare phenomena, since usually, eclipses occur in pairs. This is a rich and fertile time for creativity, and for opening up to new realms. Be mindful of new dimensions, hidden aspects of your reality and within your mind. Taurus is all about stability; it's about rooting ourselves and plugging into the progressive beat of the earth. Feel that connection, sink your roots deep down in. With this stellium of planets in Taurus (Mars, Mercury, Sun/Moon, and Pallas Athena), this generates a powerful determination, focus, and patience to carry things out--urging us to progressively and methodically participate in the process of deep and lasting change. Because this is a south nodal eclipse, wherever it lands in our horoscope, is an area of life in which we must consciously shift and transform the energy, because there is a massive build up of stagnation, and something has got to give. If this eclipse touches specific planets or points, ideally by conjunction, then this process will be exceptionally pronounced. It creates the feeling that whatever it is, can no longer wait, something has to change, it has to get moving. This can be a challenge to navigate because Taurus must do things slowly, progressively, and over time--and yet, there is an unconscious impatience due to the prolonged period of inaction or immobility. Patience and persistence must be balanced with a strong sense of motivation. The Moon passes over the Sun, momentarily shrouding its light in darkness. It's a sacred moment, beautiful and haunting. Whether one is able to physically witness this event or not, it occurs within us all, in our minds and within our very soul. It permeates all dimensions. What we see is only the shadow, the very tip of a process our limited awareness can but partially grasp. Understand that this is a collective process of unfolding, we're all apart of it. This is a critical time of deep growth and transmutation, on both a collective and personal level. It is through these transmutations that, at the other end, we find ourselves on a very different path than we originally had planned. In Taurus, we're dealing with issues of self-worth, personal and collective values, and resources. Obviously, core values will be challenged willingly or unwillingly. Going within and assessing these matters is rather crucial right now, and will have lasting benefits later down the road. Everything outside us, every unfolding event or circumstance is but a projection of an inner process. When eclipses occur, this reality becomes increasingly clear. The division between inner and outer becomes momentarily blurred, and we can but glimpse, briefly, the deeper mechanization of consciousness. There is innately a strong desire to change and transmute certain aspects of our lives. It is a powerful "fork in the road", which we can consciously navigate if we so choose. Taurus is a fixed sign, so there is an equally strong desire to maintain things, and this presents some conflict between the desire for personal change and an equally powerful inclination to just "keep the peace", or to keep things as they are because they feel stable and secure. However, with Mars at the south node, there is much less complacency and much more impetus, which can result in action or possible frustration. Again, it's important to trust the process that's occurring right now, even if you're unsure of where exactly it's all going. We're invited to deeply look into what it is we really want, value, and identify with--and sometimes that's a rather painful process. Letting go of attachments is never easy, but whenever we really just throw ourselves into this, we are often surprised by what gets put back in its place. Whatever changes made within you now will be the foundation for future stability, which ensures success in weathering storms ahead. Everything changes; it happens whether we participate or not. It happens within, and it happens without. We can choose to hold on and get carried away by the storm, or we can let go, and let the tidal wave of transformation sweep us up on a wave of creativity. Either way, we change. Either way, we move on. We're dealing with a lot of energy here, since there is a rather large cluster of planets surrounding this eclipse. What are you identifying yourself with? Are you using it to hide something about yourself? Does it truly represent you on an authentic soul level? Dig deeper to the core, there you will find valuable gems. At the root of it, the Taurus archetype operates most functionally when the aim is self-sufficiency and internal validation. Be diligent; when coming up against a roadblock, keep going. Slowly and methodically go deeper, really deep, and see where it all goes. It might take some time, a little hard work, but the process is what it's really all about. Oh, and be gentle with yourself. Athena, warrior goddess of wisdom. This opens the potential for devising creative strategies in regards to resources. New ideas may simply plop into awareness, and suddenly the path before you makes a little more sense than it did before, albeit slightly re-routed. Equally, this allows for a critical scrutiny of what's going on beneath the facade of our attachments. In Taurus, Mars gets a little frustrated, but that's ok. Mars coming in here allows us to get active in the process of transmuting past patterns of stubbornness and stagnation. "Keep calm and carry on" just isn't going to do it anymore. This is a powerful impetus for change. While having to contend with much slower pace, Mars still provides a valuable fuel for deep and lasting transformation. The Pluto/Uranus Square is the background scenery of social unrest, scientific breakthroughs, and a practical integration of radical concepts, theories, and methodologies developed around the Pluto/Uranus conjunction in the late 1960's. Ceres, the earth mother, faces Pluto (god of the underworld) head on. With the Taurus archetype deeply fermented by this eclipse, we are dealing with powerful themes surrounding the health and well-being of our bodies, which are extensions of the greater body, the planet Earth. This is a powerful collective shift toward the awareness that we must make some critical choices in how we relate to the planet, and how we relate to our own bodies. We live in a very strange and alien world currently, one that is strikingly much different than it was even forty some years ago. We are completely saturated with toxins and synthetic pollutants. We're exposed to a daily bombardment of stress inducing frequencies and vibrations. We truly have no idea the long term consequences that all of this will have upon our very genetics. We are already witnessing a pandemic of disease, mutation, and mental/emotional dysfunction on a scale unheard of in human history. This isn't a negative take here, it's just a cold hard look at reality; and that's what this configuration asks us to do. Take a cold hard look at how our desire to control and manipulate natural forces has led to this ever increasing state of collective and global entropy. Ceres, quite simply, deals with food and nutrition. It's the ultimate bottom line. Really, it is. We all have to eat; without food not much would happen. With Uranus in the mix, obviously we get themes of genetically modified and chemically altered foods. Something is shifting here with all of this; this is a critical collective and personal turning point in relation to what we choose to put into our bodies. It's not as simple as just going back to the way things used to be, things are much more complicated. With Uranus, we are challenged to find innovative ways of merging past wisdom with current technological advances. What would otherwise be a mostly meditative and peaceful "in the moment" type of eclipse, gets a slight jolt of a cerebral and mental interlude (along with Venus in Gemini). This can create a bit of a conflict between a more internalized process and one motivated by an insatiable curiosity in regards to external affairs. Used constructively, we can integrate all this mental chatter by getting really grounded first, and making sure we have a solid base before expanding outwardly. 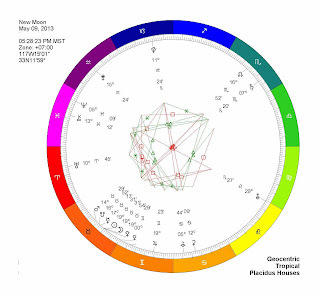 Venus, ruler of the eclipse, shifts into Gemini, conjoining the fixed star Alcyone, the central star of the Pleiades. We experienced an Annular Solar Eclipse at this position last May, and that portal is quite active here. Look around for connections. It feels as if some bridge is forming between last years Transit of Venus/Eclipse energy (May-early June 2012) and the process we're experiencing now. Alcyone represents a cathartic release of deep emotions, and sometimes deals with themes of great suffering. This energizes a healing process that's been in the works, creating more motivation and excitation toward becoming more whole and complete within oneself. Pluto's sextile to Chiron further deepens this process, allowing for a gentle, and yet penetrating transmutation to take place. Opportunities to integrate and heal are at hand. April 30, 2013- Prior to the event, Venus conjoins eclipse portal.